Every year at this time we regularly answer the question “when will the hummingbirds arrive”? Ruby-throated hummingbirds do begin migrating into and through TN as early as the latter part of March, with the bulk of them arriving or passing through between mid-April and mid-May. Those that stay in mid-TN then begin the task of courting and nesting. Their interest in feeders is minimal at this time. Why? Unless a hard freeze kills blooms and no flowers are available nature provides hummingbirds with everything they could possibly need, which is nectar from plants, and insects for protein. 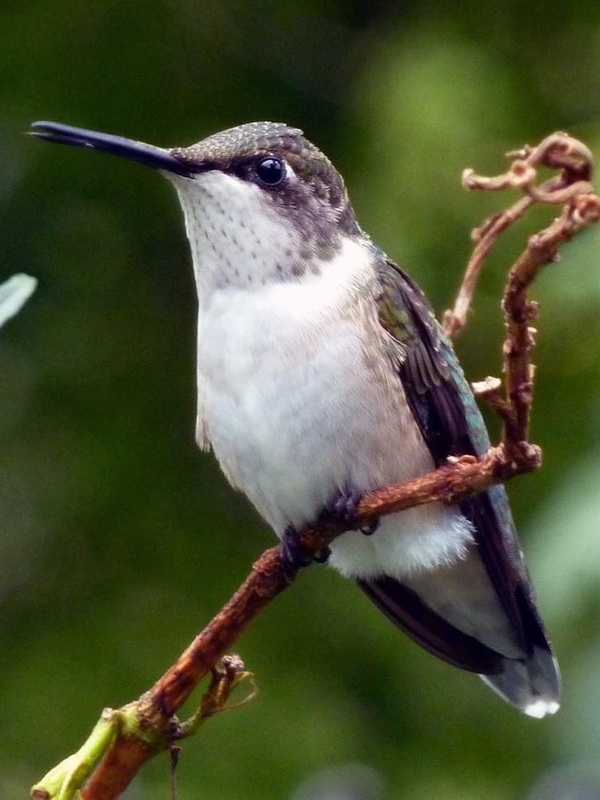 Remember, Ruby-throated hummingbirds have been making the journey to North America from central and South America to breed for roughly ten thousand years. They would come here whether we had feeders full of sugar water or not. They will come to feeders when they are ready and that typically occurs near the end of their breeding season, usually starting around June to mid-July. People living in rural areas tend to see hummingbirds earlier and more often than people in more urban areas. Why? The simple answer is rural areas provide more nesting habitat for hummingbirds. So, if you are wondering when to put up a hummingbird feeder you may do so now. However, do not expect to see a lot of activity. It is certainly possible you may see a bird or two take advantage of the feeder before moving on to its final destination. The best nectar you can offer hummingbirds is a simple 1 part sugar to 4 parts water solution. It is not necessary for the water to be brought to a boil before adding sugar. The nectar is ready after the sugar has been stirred in and fully dissolved. Do not add color in the form of food dye. Color is absolutely unnecessary and potentially harmful. Also it is not good to use natural raw sugar, the kind that is slightly brown in color. Regular white table sugar is recommended. Are birds fighting your windows? It’s called image fighting. Every spring we are inundated with the question “why is a Cardinal trying to get through my window?” Cardinals are the most common bird to image fight, but it can be any number of species including Eastern Bluebird, American Robin, Eastern Towhee, and Mockingbirds. Cardinals are probably the most common because they often nest in shrubs close to a house. Image fighting refers to the sometimes constant presence of a bird fluttering at and making contact with a window, or many different windows of a home. Sometimes it will be the side view mirror of a vehicle. During the breeding season a bird’s sense of territoriality is heightened. 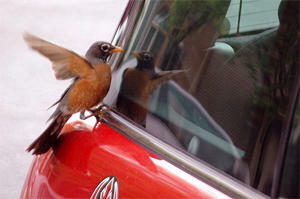 A bird will pass a window and detect the movement of a bird that appears to be the same species. It will fly up to the window see its reflection and begin trying to drive away the competitor. It’s the result of a basic instinct that has not been able to adapt to a man-made object. This activity can go on for months, and beyond the breeding season if unaddressed. The bird rarely injures itself seriously. Mostly it just creates a mess on the window and sill. We recommend stopping this pattern of behavior as soon as possible so the bird can resume normal activities and not annoy you. The best way to stop this activity is to block the source of the reflection for a period of no less than a week to start. This can be achieved by putting up any opaque material: a sheet or towel, cardboard cut to the size of the pane of glass, it really doesn’t matter as long as the bird cannot see itself. Closing the drapes or shade on the inside doesn’t usually help. Putting it on the interior can actually make the reflection more pronounced. A couple of inflated balloons on a piece of string taped to the glass works very well, too. The balloons move around with the slightest breeze which keeps the bird from wanting to approach. Again, try this for no less than a week. Repeated applications may be necessary. Usually the behavior lessens or stops after the birds have fully delved into its first nesting, or after breeding season concludes. Try one of these methods to help your birds get back to the business of raising young. Looking for Spring birding opportunities? Richard Connors will be offering his bird identification class at Radnor Lake again this spring. The 5-week class runs Tuesday mornings from April 9th to May 7th, and includes classroom sessions and morning bird walks. Radnor is a premier location for spring migrants and those migrants are often heard more easily than seen, so this spring class will emphasize "birding by ear". We will work on bird identification by sound as well as by sight. The class is open to beginners, but some prior knowledge of our local birds will be helpful. There is a fee for the 5 week class with part of the proceeds going to Friends of Radnor Lake.